Posted in Ed tech, News, under Africa. Tagged with African Union, edtech, PAU. A new virtual higher education option designed for Africans within Africa will soon be launched: the Africa Virtual and E-University which will offer studies through the Open Distance and e-Learning model. 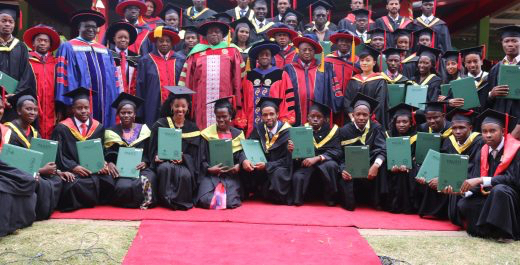 MSc students at the Pan African University's Institute of Basic Sciences, Technology and Innovation at JKUAT in Nairobi, Kenya during the second graduation ceremony. Photo: Jomo Kenyatta University of Agriculture and Technology (JKUAT). Buoyed by the success of the now well-established Pan African University, a continental institution of excellence owned by the Africa Union (AU), the body is in the final stages of operationalising the project. To be run as an e-learning arm of the African Union’s PAU, the E-University will offer distance education to students from across 54 countries in the continent, using English and French as languages of instruction. The AU will convert the existing African Virtual University – an already established virtual institution of higher learning established by 19 African countries since 1997 – into an arm of the PAU, making it an Africa-wide university accessible to interested learners from across the continent. “This choice has a number of obvious advantages over other options, including faster implementation and operationalisation, does not require major political decisions for establishment, and has in place administrative and governance structures including the council, senate and rectorate”, stated a concept document prepared by AU’s department for human resource, science and technology. “It will offer the African diaspora and the international academic community, an innovative continental framework to contribute towards the development of higher education and research in Africa”, it added. Following the decision, the university will effectively change its name from African Virtual University to Africa Virtual and E-University, says the paper prepared under the leadership of Beatrice Njenga, head of education at the AU Commission. The transformed institution will also move its headquarters from Nairobi, Kenya to Yaoundé, Cameroon, the seat of the PAU rectorate. The E-University is listed as one of the flagship projects of the African Union’s Agenda 2063, a blue for accelerated development on the continent. Established in 2012, the PAU a continental institution of excellence mainly in sciences has branches in Kenya, Cameroon, Nigeria and Algeria with one more planned in South Africa. I think it is very great that Africans develope as other countries at the almost same level. They really deserve it and value it. My children don’t appreciate education that ourv country provides. Moreover they dont do their homework and other academic papers and ask for it https://pro-papers.com/ourServices . They dont even understand that it will spoil their knowledges and future. Finally African countries are starting to invest in their education. I think African development, maby not the whole continent, will be very important for the whole world. I guess that this is really great article.Thank you very much! This topic is very important.